The Drawing Wizard allows you to quickly draw a complex shape selected from a library. Select the Drawing Wizard icon from the graphic editor toolbar. 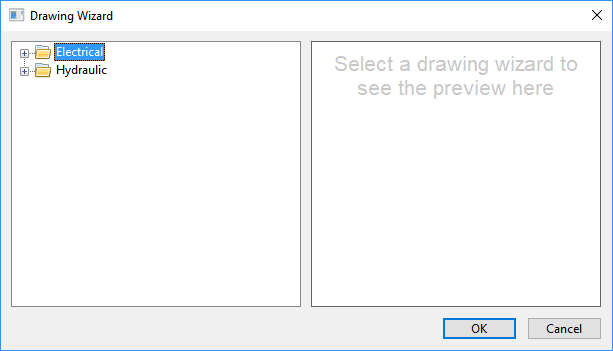 The Drawing Wizard dialog will open. In the left pane, expand each folder to explore the available wizards. Select a wizard to show a preview of the symbol in the right pane of the dialog. Click OK to choose the wizard and close the dialog. Press the mouse button down on the drawing canvas to define the start corner of the rectangle where the file will be imported. Drag the cursor to define the size and orientation of the shape. Release the mouse button to complete the wizard. Note: The symbol will be inserted into the drawing canvas as a Group Item. 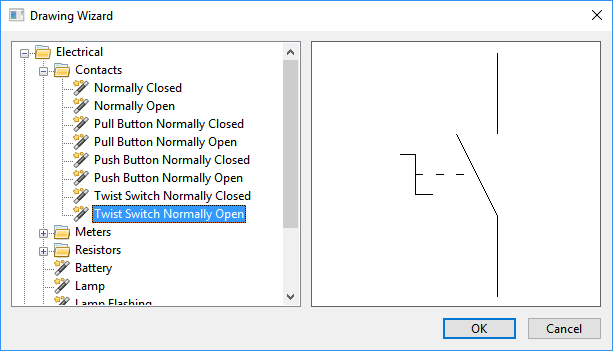 While in drawing wizard mode you can temporarily switch to the last select mode, by holding down the <Ctrl> key down.